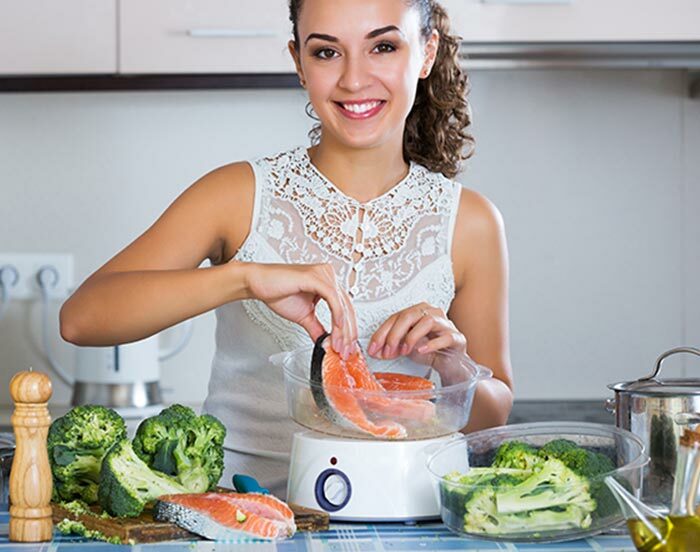 Pre-pregnancy nutrition is extremely important if you are planning to have a baby (1). It increases your chances of getting pregnant, maintains a healthy pregnancy, helps you have a healthy body, and increases the likelihood of giving birth with few or no complications. In fact, it prepares your body and mind for the arrival of the little one. Keep reading to find out all about it. You need to prepare your body for pregnancy by adding some key nutrients to your diet. Here’s a list of the nutrients and their food sources. Take a look. The Centers for Disease Control and Prevention (CDC) recommend all women of reproductive age to take 400 mg folic acid per day along with folate from various food sources. Folic acid helps reduce the risk of birth defects like spina bifida and anencephaly (1). Folic acid (or vitamin B9) is used by our body to make new cells. 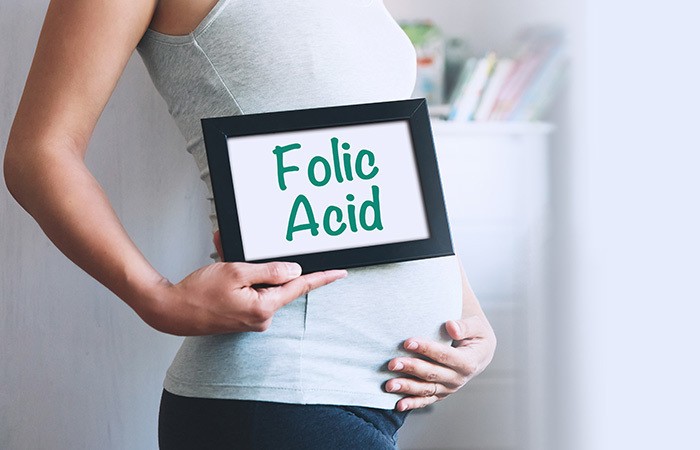 Women who want to get pregnant or are pregnant can benefit from consuming folic acid as it helps in the development of the neural tube (the hollow structure from which the brain and the spinal cord of the baby develop). 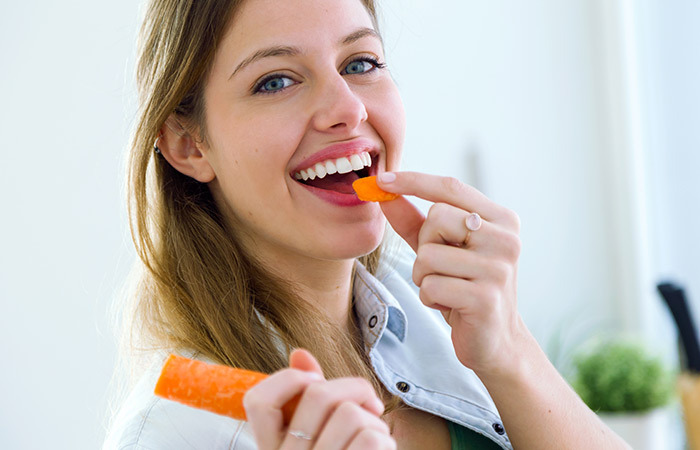 Folic acid is found in various vitamin supplements and in natural as well as fortified foods. Here’s a list of sources of folic acid. Green Vegetables –Spinach, kale, radish greens, mustard greens, Swiss chard, bok choy, asparagus, Brussels sprouts, celery, okra, and broccoli. Blanch or sauté them in good quality olive oil to enjoy a delicious and nutritious meal. Root Vegetables – Beets and turnips. Fruits – Oranges, grapefruit, lemons, limes, strawberries, raspberries, papayas, bananas, and avocados. Have at least three different fruits twice a day. Beans And Nuts– Kidney beans, lentils, peas, garbanzo beans, black-eyed peas, walnuts, almonds, peanuts, and hazelnuts. Do not consume too many nuts if you are trying to lose weight to increase your chances of getting pregnant (more on that soon). Seeds – Flax seeds and sunflower seeds. Animal Products – Eggs, meat, dairy, and salmon (be careful with the mercury levels in fish). Whole Grains –Wheat germ and bulgur. Fortified Foods – Breakfast cereals, fortified bread, and fortified pasta. Calcium is an extremely important micronutrient for you and your baby. Your baby’s teeth and bones will require calcium, and so will you to carry your baby for nine months in your womb and be able to walk and do moderate to easy chores. Taking calcium supplements or calcium-rich foods also helps prevent osteoporosis when you conceive. You must aim at getting 1000 mg calcium per day. Vegetables –Kale, spinach, and broccoli. Dairy – Milk, calcium-fortified milk, yogurt, and cheese. Calcium Fortified Juices –Calcium-fortified orange juice, cranberry juice, and other vegetable juices. Make sure that these juices do not contain too much sugar to prevent excessive weight gain. The WHO recommends taking 30-60 mg elemental iron per day (2). Taking iron before you get pregnant will prepare your body for the increase in blood volume (by 30-40%) during pregnancy (3). When blood volume increases, the iron levels are depleted in many pregnant women, leading to anemia. Consuming iron-rich foods or taking iron supplements will also ensure that there is sufficient oxygen available for you and your baby. 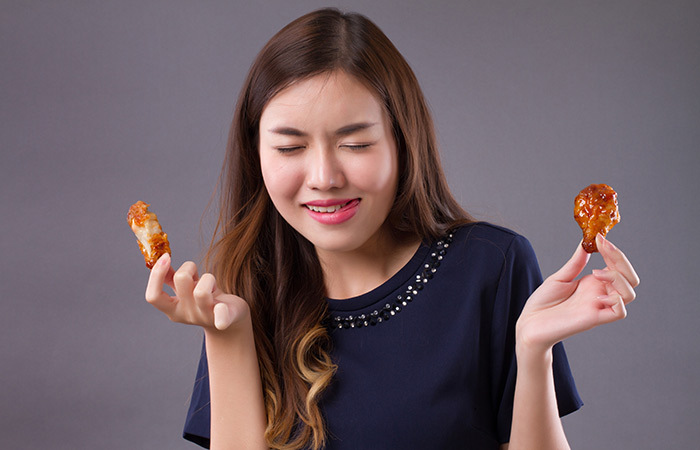 Animal Sources – Chicken, ground turkey, beef, poultry, lamb, pork, oysters, fish (find out the source of the fish to prevent heavy metal poisoning), and yogurt. Vegetables –Broccoli, spinach, tomato, bell pepper, asparagus, edamame, snow peas, potato with skin, turnip, beet greens, peas, beetroot, and kale. Fruits – Apricot, prunes, and hearts of palm. Proteins – Eggs, lentils, beans, soybeans, tofu, tempeh, chickpeas, peas, hummus, and canned baked beans. Grains And Grain Products –All types of cereals, oats, granola bars, and pasta. Nuts And Seeds – Almonds, cashews, hazelnuts, pistachio, toasted sesame seeds, and nut butters. Iodine is extremely important for your child’s healthy brain development. The WHO recommends consuming 150 mg of iodized salt per day (4). 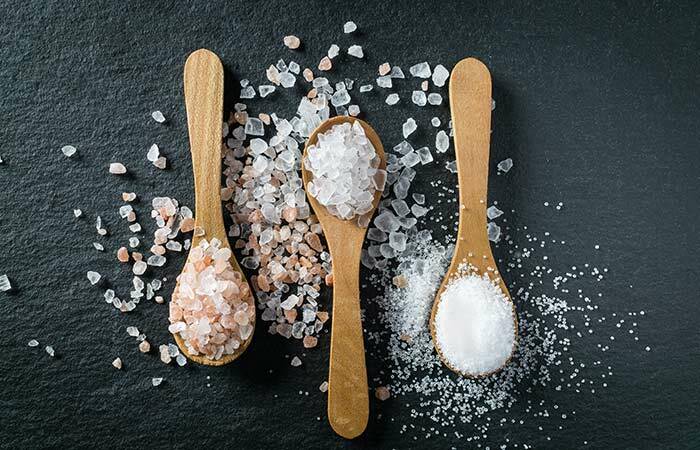 Salt – Iodized salt (Do not consume too much salt, especially if you are hypertensive). Dairy –Milk, yogurt, and cheese. 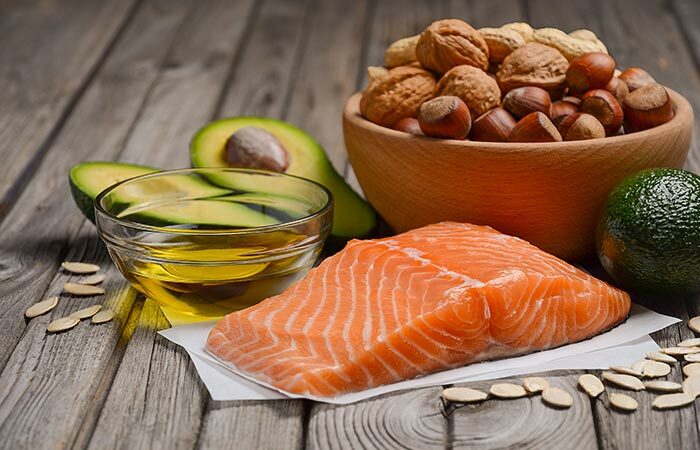 Healthy fats (or omega-3 fatty acids) help reduce inflammation in the body and prevent inflammation-induced weight gain. Omega-3 fatty acids also stimulate ovulation-inducing hormones and increase the blood flow in reproductive organs. These healthy fats are also the building blocks of the fetal brain and retina. Moreover, they are good for preventing perinatal depression (5). You must consume 320 g of seafood per week. Nuts And Seeds – Walnuts, peanuts, macadamia, cashews, nut butters, sunflower seeds, flax seeds, and pepita. Oils – Olive oil, avocado oil, and rice bran oil. Dietary fiber helps improve bowel movement, increases satiety, and aids weight loss. If you are planning to have a baby and are overweight, we recommend that you bring your weight down to the range that is right for your height, weight, and age. Being overweight or obese can trigger hormonal imbalances that may prevent you from getting pregnant. Consume high-fiber foods and get your metabolic rate kicking. Vegetables –Spinach, chard, kale, broccoli, sweet potato with skin, beetroot, carrot, celery, bok choy, arugula, and okra. Fruits– Prunes, cranberry, strawberry, orange, plum, pluot, peach, pineapple, blueberries, and blackcurrant. Beans And Legumes –Lentils, kidney beans, lima beans, edamame, garbanzo beans, Bengal gram, and dried white peas. Nuts And Seeds – Walnuts, peanuts, macadamia nuts, cashews, nut butters, sunflower seeds, flax seeds, and pepita. Whole Grains – Brown rice, black rice, red rice, buckwheat, broken wheat, wheat, barley, sorghum, and oats. Proteins are the building blocks of your body. Your hair, nails, saliva, hormones, muscles, cells – everything is made of proteins. Proteins can also help you lose weight and build lean muscle mass. Consume 1.1-1.5 g protein per kg body weight before pregnancy depending on your height, weight, age, and daily activity levels. Plant-Based Sources – Lentils, soybeans, lima beans, peas, garbanzo beans, kidney beans, soy chunks, and edamame. Dairy –Milk, yogurt, buttermilk, and cheese. Seafood– Fish, clams, prawns, crab, and mussel. Meat –Chicken breast, beef, pork, and turkey. Main Idea – Choose foods that will help build a strong and healthy body for you and your baby. Make sure that you consume foods that you are not allergic to. Apart from nutrition, you must also take care of your lifestyle. Improve it by following the tips listed in the next section. Smoking is harmful not only for you but also your baby. It can increase the risk of gestational hypertension and put your baby’s health at risk (6). So, quit smoking if you are trying to get pregnant. Alcohol consumption during pregnancy is a strict no-no (7). However, you may drink limited amounts of wine while preparing your body to get pregnant. Talk to your doctor to figure out your alcohol intake limit. Being overweight or obese can prevent you from getting pregnant. It can also lead to complications during pregnancy and birthing. To avoid such complications, start getting active. Join a gym or a physical activity class (a sport, dancing, or swimming). 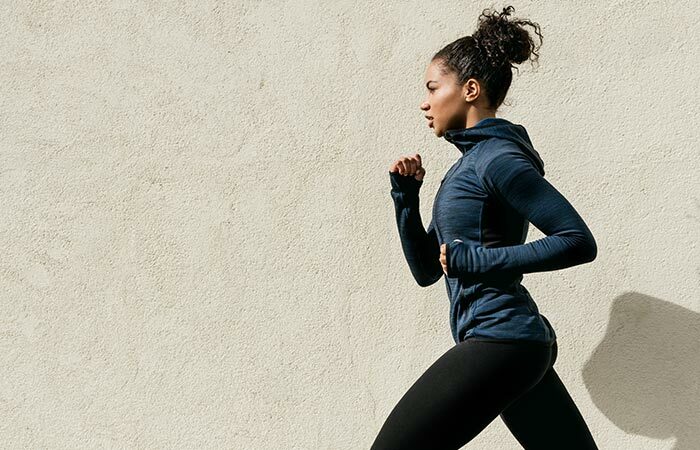 Working out regularly will also stimulate the secretion of the “feel good” hormones that help you stay motivated and feel good about yourself. Consult your doctor to find out if you lack any micronutrients. If you do, you must take supplements to make up for them. Certain micronutrients directly or indirectly help improve the levels of reproductive hormones and prepare your body for a healthy pregnancy. Stress is a silent killer. It increases the circulation of harmful free oxygen radicals, which can alter the DNA structure and cause the production of faulty proteins. The more stressed you are, the lesser your body and brain functions normally. Reduce stress by sleeping well at night, spending time doing what you like, taking up a hobby, meeting friends, and taking time out for yourself. Coffee, tea, chocolate, and energy drinks are sources of caffeine. You may drink two shots of espresso, three cups of green tea, and have a square of 80% dark chocolate per day, but do not exceed this limit. Avoid caffeine altogether if you are caffeine sensitive. 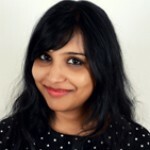 Main Idea – Your lifestyle also matters when it comes to a pre-pregnancy diet. Get active, reduce stress, sleep well, and discard all your unhealthy habits. Preparing to get pregnant can be stressful. But, you can do it peacefully if you have the correct guidance. Talk to your doctor regularly, track your ovulation cycle, consume the right foods, and follow a healthy lifestyle. Prepare your body and mind to experience the best feeling in the world. Do you have any more questions or suggestions regarding the diet and lifestyle one must follow when trying to get pregnant? Leave them in the comments section below, and we’ll get back to you! “Prenatal nutrition: a critical window of opportunity for mother and child.” Women’s health, US National Library of Medicine. “Daily iron and folic acid supplementation during pregnancy” WHO. “How To Treat Iron Deficiency Naturally During Pregnancy” American Pregnancy Association. “Iodine supplementation in pregnant and lactating women” WHO. “Omega-3 Fatty Acids and Pregnancy” Reviews in obstetrics & gynecology, US National Library of Medicine. “Smoking before pregnancy and risk of gestational hypertension and preeclampsia.”American journal of obstetrics and gynecology, US National Library of Medicine. “Drinking During Pregnancy and the Developing Brain: Is Any Amount Safe?” Trends in cognitive sciences, US National Library of Medicine.